"The Once and Future Mutant"
The New Mutants get drawn into the conflict between Franklin Richards and Ahab. 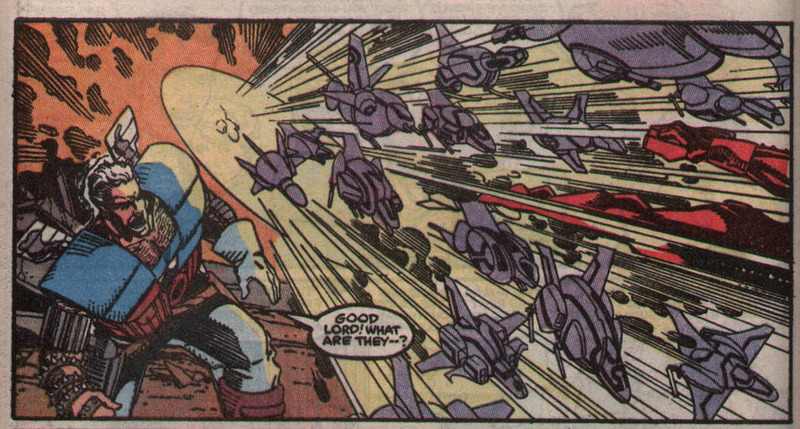 Franklin Richards arrives at the X-Mansion. Disturbed to find it destroyed, he transforms it into the place he remembers. Meanwhile, Ahab dispatches ones of his Hounds and a group of scout ships to destroy Franklin. Back at the school, as the New Mutants finish a Danger Room session, a group of students, including Franklin and Doug Ramsey, suddenly appear. 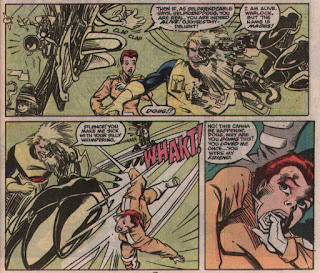 When Doug reacts violently to Rahne, Rictor attacks him, and fight between the two groups breaks out. Eventually, Cable leads the New Mutants out of the Danger Room, where they encounter an older Banshee, allowing cooler heads to prevail. When the New Mutants realize Doug and the rest are all illusions created by Franklin, Franklin freaks out and disappears, and the mansion returns to normal. Just then, Mr. Fantastic, Invisible Woman and Banshee arrive, having tracked Franklin to the school. As they compare notes on the situation, Ahab's Hound and the drones suddenly materialize, and attack. The New Mutants and their allies fight back. Eventually, the beaten Hound declares that Ahab will kill the present day Franklin Richards to protect the timeline, if necessary. Just then, Ahab appears, and kills the Hound for revealing so much, then disappears. Returning to his fortress, he detects Franklin's return to Manhattan. But Mr. Fantastic had detected him as well, so everyone sets out for the city. 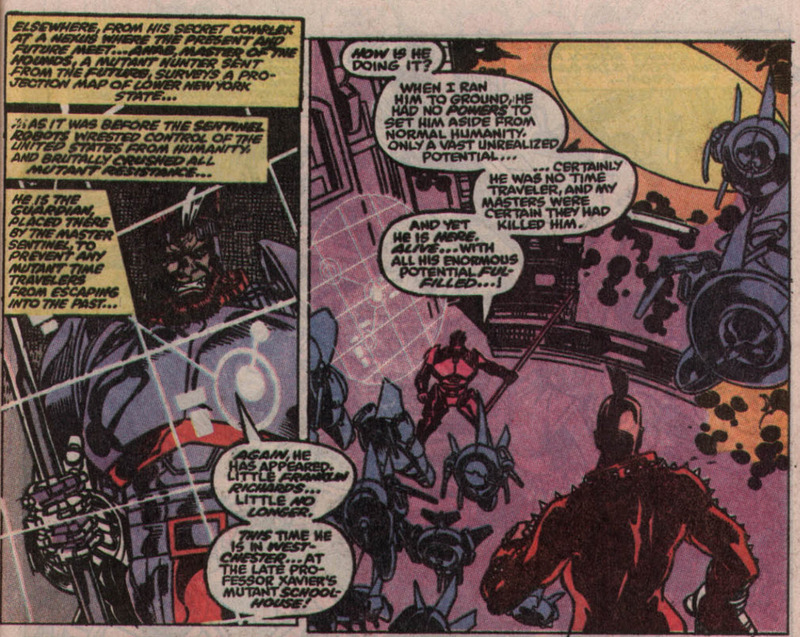 In Manhattan, Franklin conjures up a version of Rachel Summers, but is attacked by a group of Hounds and Sentinels sent by Ahab. 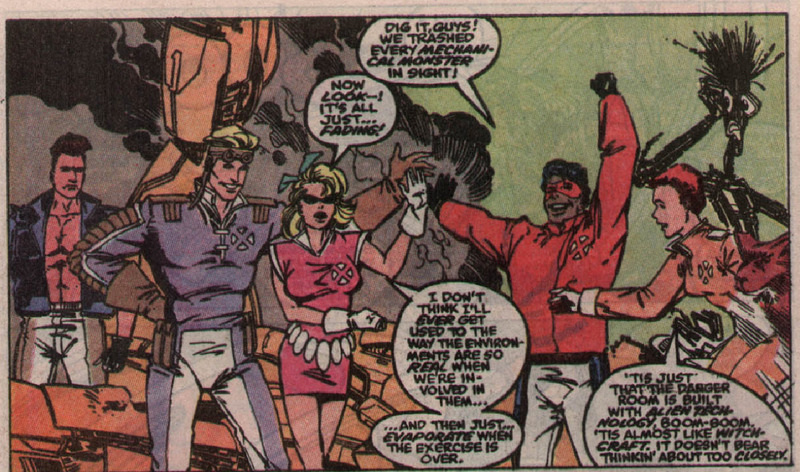 He is helped by the arrival of the New Mutants and company. Another battle commences, during which Franklin kills the Hounds. Watching this, young Franklin realizes adult Franklin is bad, and declares he doesn't want his powers anymore. The two Franklins merge briefly, and the young one collapses. Adult Franklin declares his younger self's powers are gone, and when Mr. Fantastic urges him to undo his actions, he disappear again, leaving his younger self alive, but comatose. This issue concludes with Rictor ominously noting that Cable looks a lot like Ahab, another hint at Cable's possible identity. By all accounts, however, nobody ever seriously entertained the notion of linking Ahab and Cable; rather, this was thrown out as a possibility simply to build the air of mystery around the character. One of the future X-Men that Franklin manifests is an older version of Doug Ramsey, who has merged with Warlock and calls himself Magus. It's the first, but certainly not the last, time we'll see an alive Doug trotted out for shock value and a techno-organic Doug. The future Banshee is one of the New Mutants teacher, another unintentional nod to his eventual role as Generation X's headmaster. 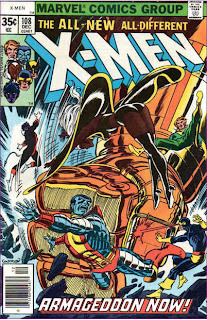 Though the cover and interior masthead declares this issue to be Part 3 of the four part story (and though it was on sale after X-Factor Annual #5), it is in fact the second part of the story. 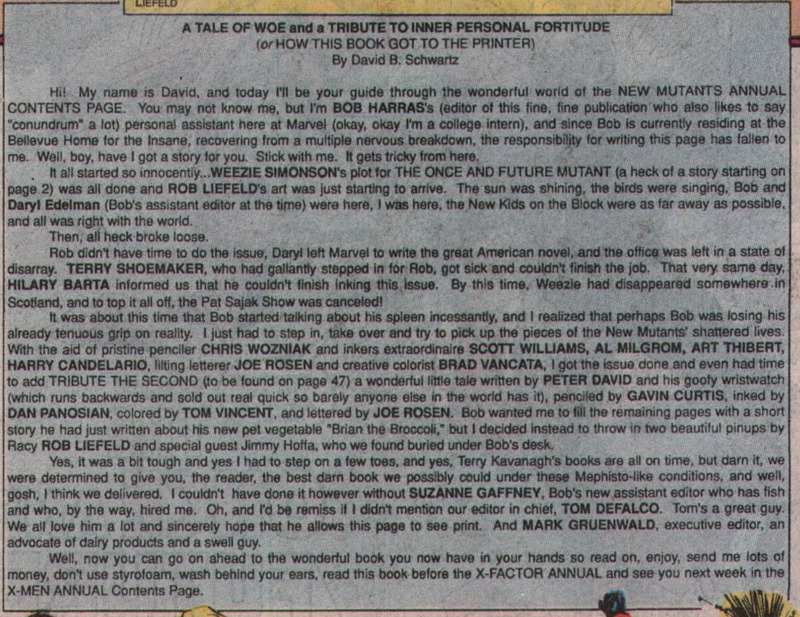 An editorial, written by Bob Harras' assistant, appears on the front page, detailing some of the hurdles overcome in the production of the issue, and reading that makes it less surprising that the order of the story's chapters got screwed up. This issue features a second story, which is actually rather nice, in which Rahne visits Doug's grave asking for permission to move on with Rictor, and the ghost of Doug, hanging around the cemetery with two other ghosts, comes to terms with his own passing as well. 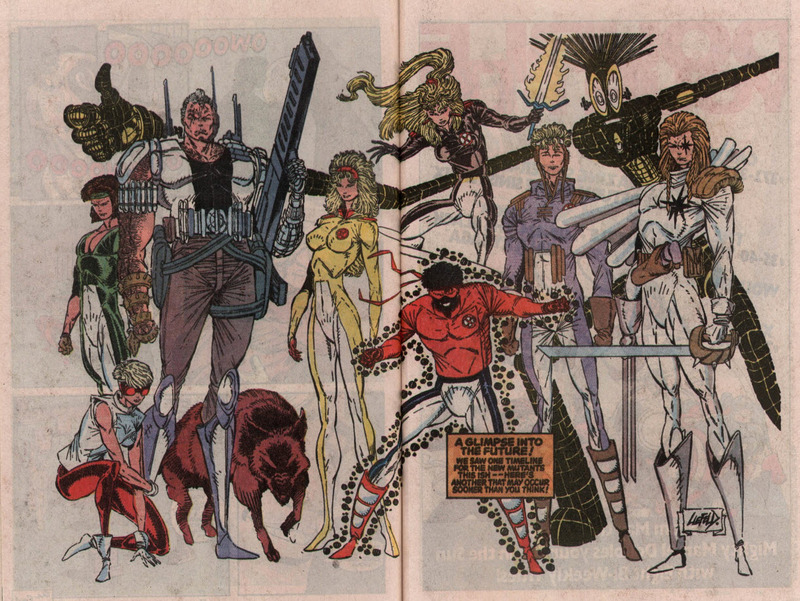 Additionally, there's an ad for the upcoming New Mutants Summer Special, and two pinups from Rob Liefeld, one of which shows a possible future incarnation of the team featuring a character who strongly resembles Shatterstar. Rob Liefeld, who will be needing fill-in artists on the regular series very soon, does not draw this issue, though he does provide a cover. Interior art comes from Terry Shoemaker, no stranger to the New Mutants from his pre-Liefeld fill-in work on the series, and Chris Wozniak, whose work looks much better here than in recent Excalibur issues; it's much more polished, almost reminiscent of Art Adams work, with a little bit softer lines, at times. This issue reveals that Ahab is in charge of preventing attempts to alter the timeline by time travelers, and is the master of the mutant-hunting Hounds, of whom Rachel was one before she traveled back in time. We also see that Ahab's weapon of choice is a harpoon. 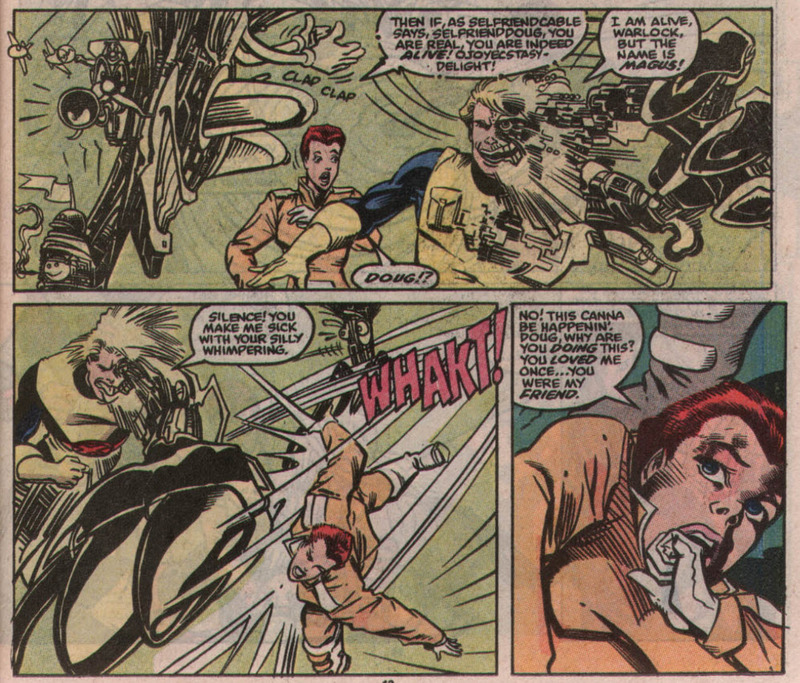 Rahne notes it's best not to think too hard about the mechanics of how the Danger Room works. 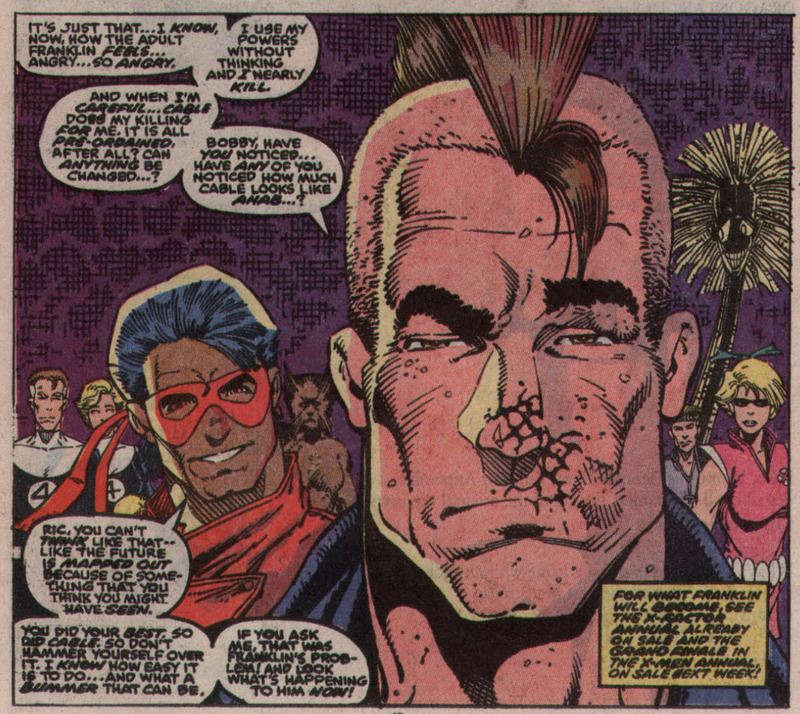 Rictor continues to have something of a chip on his shoulder about Cable. Seeing the future New Mutants, Roberto is reminded of his own encounters with possible future selves, and his determination to avoid becoming evil like his father. Banshee also has a past with Cable, or at least knows who he is by sight. 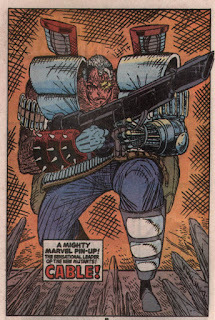 Cable spends most of this issue wearing the attire he wore in his first appearance; clearly, that look has become the reference for fill-in artists (whereas Liefeld just gives him a new look every issue). This reads much more like a typical annual. Though the story definitely follows on from Fantastic Four Annual #23, with adult Franklin confronting the New Mutants followed by a battle with Ahab and his Hounds, it's more self-contained than the previous chapter. 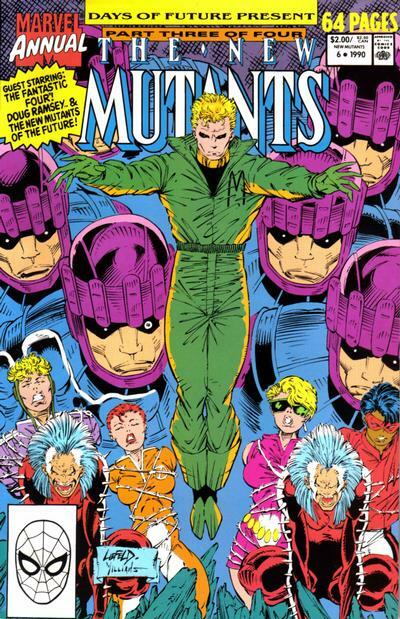 Reading the previous one certainly helps, but there's still enough here that ties in with the goings-on in the regular series to satisfy New Mutants fans: the team encountering a future, still-alive version of Doug Ramsey, Roberto's ongoing fear of growing up to become his father, the still-prickly Rictor/Cable relationship and the blossoming Rictor/Rahne one. 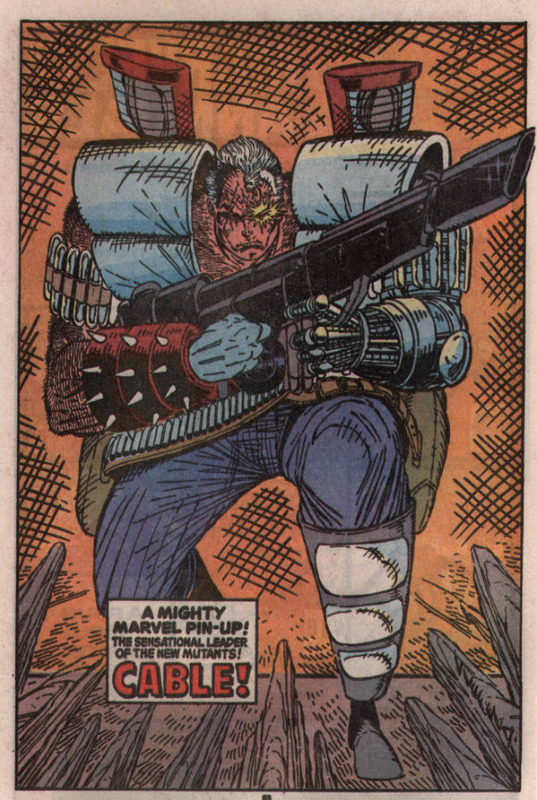 Of course, Rob Liefeld was never going to work a double-sized annual into his schedule (there's a few fill-ins on the regular series already upcoming), so we get to see a different artist handle his new character and uniform designs, which work for the most part (though not having Liefeld around drops the fun factor a few notches). As part two of a four part story, this works okay; we get more of Ahab, but Adult Franklin is still mostly a cipher, popping in, throwing a fit, then popping out. Thankfully though, this works better as a standalone New Mutants annual than the previous chapter did as a Fantastic Four story, so even if the overall narrative is a bit meandering, this isn't a complete slog. Tomorrow, Franklins mission draws in the Summers family in X-Factor Annual #6. Next week, "Days of Future Present" wraps in X-Men Annual #14, followed by the New Mutants Summer Special. First off, I just discovered this site a few days ago, and have been slowly but surely catching up on the X-aminations...thankfully I am reading something as it is posted so that I can comment, rather than necro an old post. What I am intrigued by is seeing the potential future New Mutants and seeing who must be Amara and Illyana. I would have loved to have seen Liefeld artwork for them, and of course see a bunch of footless demons. 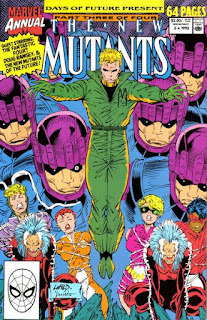 (Although I will say having read most of the New Mutant X-aminations by now that I prefer Liefeld's artwork to almost any previous artwork in the New Mutants). I've only read the UXM chapter of this serial, and for some reason, could never bring myself to purchase the TPB reprint of the entire storyline. I believe, of all the mini-crossovers in the 1990 and 1991 annuals, this was the only one to be reprinted for years (decades,even). To this day, I have a suspicion that it's the only one of the 90-91 annual crossovers that's reprinted on its own; not as a part of an EPIC collection. I rather liked the Doug story — pretty much exactly what you want from one of these annual/special back-ups, an untold tale filling in quiet moments and grace notes. So kudos to Peter David. 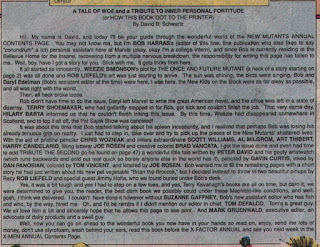 I’ve never heard of Gavin Curtis, I don’t think, who has a page’s worth of GCD art credits for Marvel around this time. Early inks from Dan Panosian are notable, as he went on to do a fair bit of work on X-family and Image books through the ‘90s, including Liefeld’s Prophet; based on that work, I was quite pleasantly surprised by several of his covers for Mark Waid’s Irredeemable at Boom a few years back. Everyone who reaches a certain age in dystopic timelines loses an eye, I guess. Future Banshee and Cable should've talked Ahab down by offering to bring him to their weekly Loss of Depth Perception Support Group. "Odin comes by sometimes and brings this incredible coffee made from beans digested by his wolves. Don't make that face until you've tried it. Really." “Weezie Simonson’s plot … was all done and Rob Liefeld’s art was just starting to arrive,” it says. I wonder if any of his pages for the story have ever turned up. I honestly loved that line. 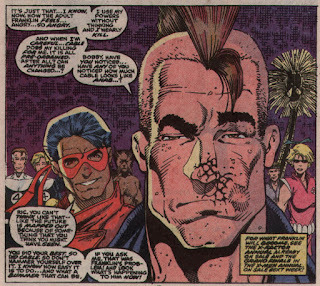 Rictor is a lot more "metrosexual" than I thought, since, despite taking place after New Mutants #91, he changed his hairstyle YET AGAIN. Whoops! The ironic premonitions of X-related plot twist yet to come ("Banshee as school headmaster!" "Pseudo-daughter for Nightcrawler!" "A resurrected Doug!") helps raise this rather messy chapter a bit, despite the lackluster art and confused chronology. 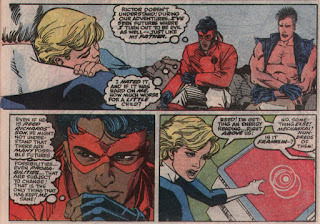 One interesting aspect is the way relationship between Mr Fantastic and his son (well "sons" in this case) is presented. 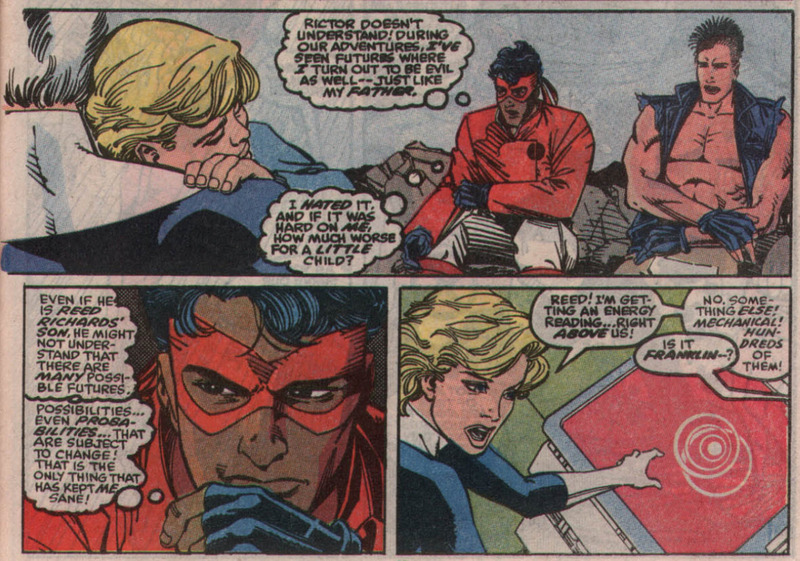 Here's the relationship looked strained, with it being implied that Franklin is resentful for all the restrictions that Reed places on him, in particular regard to his powers. Now I didn't read enough Fantastic Four at this time to know if that was always the case in their own book, so are there any regular F4 readers who can confirm if this is the way the father-son relationship was characterized in their own book.